One of the major salmon predators on the Columbia River is the smallmouth bass. Long protected because of its contribution to a highly popular sport fishery, that protection is now gone because of the predation threat to Columbia River salmon recovery. Smallmouth and walleye are highly regarded game fish, but are not native to the Columbia River. They compete with and prey upon salmon. The Columbia states recognized this and no longer regulate these fisheries. This change will help prevent expansion of these species as global warming provides more favorable conditions for these cool-water non-natives than for the cold-water salmon, sturgeon, and steelhead. Smallmouth bass have long been present in the Central Valley, especially in the lower Sacramento River and the rim dam reservoirs. Recent changes in the management of water in the lower Sacramento River will accelerate expansion of smallmouth and their preferred habitats over that of global warming alone. Smallmouth have historically been constrained by Basin Plan’s 56°F water temperature limit at Hamilton City (or Red Bluff) and the 68°F limit below Hamilton City to the Delta. However, smallmouth are highly likely to expand their population and range in the lower Sacramento River due to recent changes in flow management strategies that provide lower flows, warmer waters, and less turbidity to nearly 200 miles of the lower Sacramento River. Removing fishery protections will not solve the potential population enhancement or predation problems of smallmouth in the Central Valley. It would be a purely symbolic measure because smallmouth are so abundant and widely distributed. It is limitations on their habitat that have held back their expansion and the impact of their predation on salmonids. With the habitat limitations lessening, the smallmouth population will expand and contribute more to the predation problem. The solution is to restore former habitat limitation on smallmouth by sticking to the Basin Plan standards. For more on smallmouth life history see this excellent YouTube video: https://www.youtube.com/watch?v=hoZ81au_YZg. Note in the video the strategy of smallmouth feeding heavily in the fall on small fish to store energy for the coming winter. Fall is when the winter-run salmon juveniles produced over the summer start their 200-mile downstream journey from the upper river spawning grounds to the Bay. All 200 miles have smallmouth bass. Figure 1. 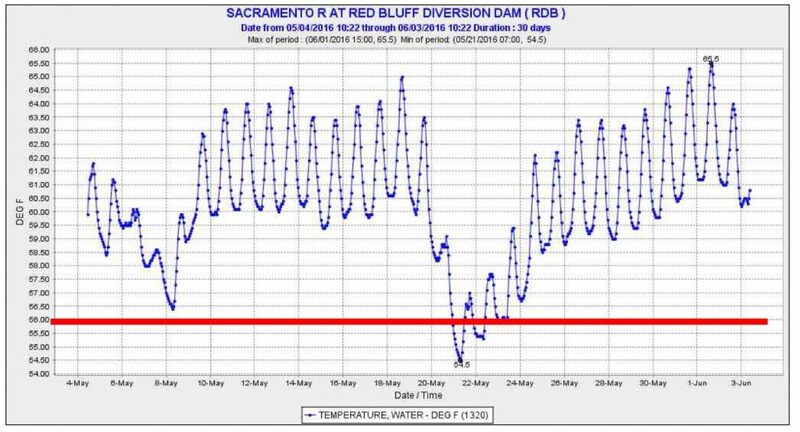 Water temperature in Sacramento River at Red Bluff (RM 243) in spring 2016. Red line depicts Basin Plan limit of 56°F for river at Red Bluff. Figure 2. 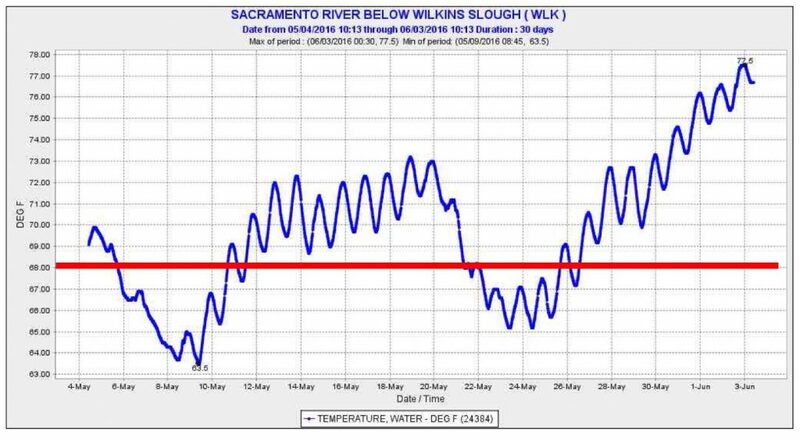 Water temperature in Sacramento River at Wilkins Slough (RM 125) in spring 2016. Red line depicts Basin Plan limit of 68°F for lower river. Figure 3. 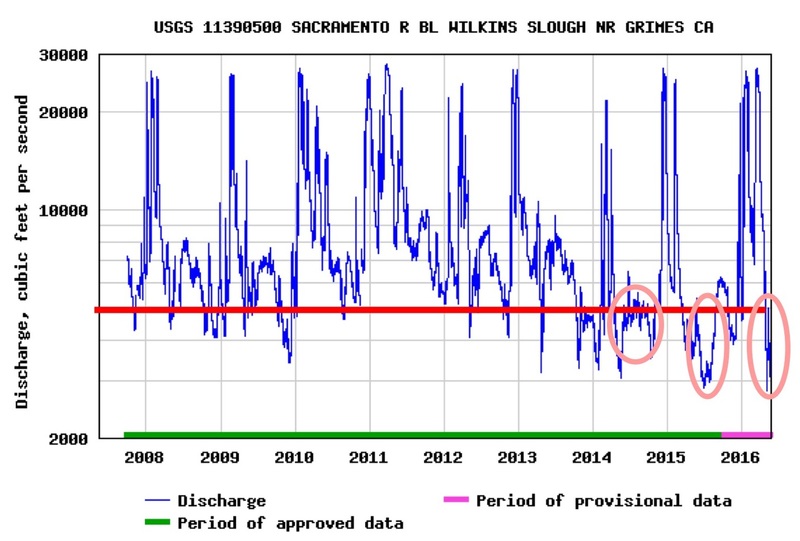 Sacramento River daily flow for years 2008 to June 2016. Red line depicts normal flow of 5000 cfs. Circles depict the tendencies for lower flows in recent years including spring 2016.